While home remodeling shows are suddenly all the rage, on networks like HGTV, these shows don’t always focus on the interior of the house. Current shows like “Fixer Upper” and “Yard Crashers” have showcased how outdoor living spaces are just as important in tying an entire property together. Luxury backyards are no longer just for people who own million dollar properties. Your house may never make it on “Lifestyles of the Rich and Famous”, but you can still have the backyard of your dreams at relatively low cost. Consider the following five luxury backyard designs as you begin to bring your personal vision into life. To achieve the Modern Luxury aesthetic, you want to create a space that is elegant, inviting, and unique. Say goodbye to that hand-me-down patio set and upgrade your backyard space with a variety of sleek furniture, stylish lighting, and gorgeous hardscaping. Emphasize neutral tones and clean geometric patterns, choose outdoor lighting that feels subtly futuristic with a touch of rustic, and if add hints of classic marble patterns and stone. 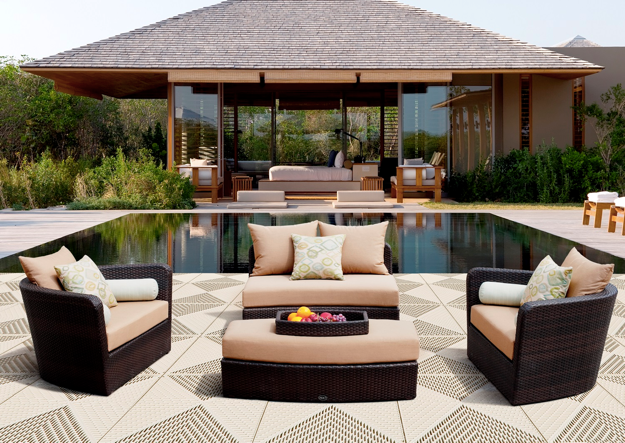 Put a modern twist on your luxury outdoor furniture by choosing cohesive pieces with clean lines and neutral tones – colorful plastics are a big no go – and add pops of color with accessories. Choose deep brown wickers, dark and light metallics, and dark wood-themed materials. Sectional sofas are the “it” thing to have in your outdoor space, as are dining sets and the occasional daybed to provide enough seating to accommodate your guests. Add pops of color with contrasting bold or bright hued accessories to give the space an updated look. Don’t be afraid to experiment with geometric designs and sleek textures to really get your guests talking. 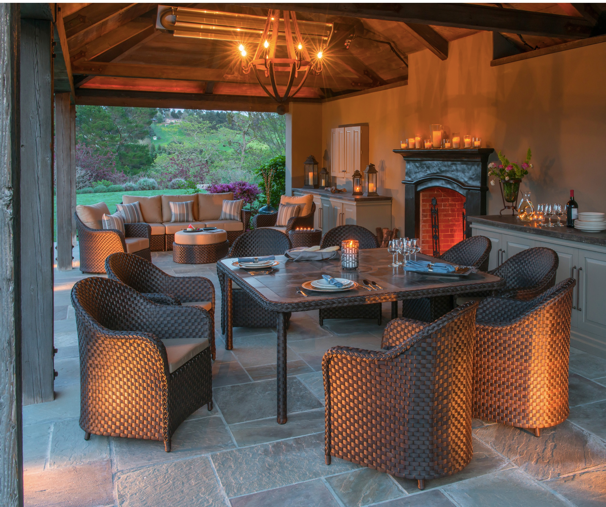 In a luxurious outdoor space, lighting is essential. If you happen to have a fire pit or fireplace as your focal point, it can provide some great mood lighting, but you’ll need more sources of light. Consider lamps, lanterns, and sconces to create the mood lighting you desire. Some go-to designs include hidden bulbs with a smooth, metallic covering, or an all-exposed bulb with geometric wiring. If you’re going all-in for the modern makeover, consider upgrading your hardscape. Adding stone walkways, stonewalls, marbles, or sleek tiles can really up the modern luxury aesthetic in your space. As far as luxury backyards go, the Pool-Side Paradise will be your summer getaway when you can’t make it to the beach. Those public pool plastic jobs should never be included in the design of this space. Whether you’re by yourself or throwing a summer pool party, it’s important to have fun in the sun and relax in the shade. Have a nice spot dedicated to sunbathing, with your large umbrella and relaxing outdoor furniture for those who need a bit of shade and a sip of peach iced tea. Patio umbrellas and chaise lounges are going to be your luxury items of choice for this design. If you can imagine yourself falling asleep on the chaise with a book on your chest and your feet warmed in the sun (well covered with sunscreen), then it’s probably the right one for you. Place your chaise lounges right next to the pool for easy sunbathing or in the natural shade or under a patio umbrella to escape the heat. Create your beach paradise right in your backyard with color schemes that create a relaxing, lounging-by-the-waterside feel. Decorate your space with creams, whites, soft blues and greens to help transform the place from a generic summer beach to a luxurious pool side paradise. You can also incorporate bright hued accessories to really bring summer into your space. Not into pools or the modern aesthetic? Recreating a nature-focused Tranquil Escape in your backyard may be just what you need to feel like you’ve ditched the city and the suburbs for the rural beyond. You can find some excellent, affordable luxury items to turn your backyard space into a real nature preserve. Make sure to surround yourself with the right earth tones and natural elements in your designed space. Go for wicker or woods, but instead of flashy, popping colors and contrasts, opt for natural, woodsy earth tones that meld into each other, or that match a more natural theme. Solid earthy colors, browns, or even deep, natural greens with different textures and muted patterns work perfect for this design. You can relax in a chaise lounge set next to a stylish, bubbling waterfall garden, or enjoy a book on a wicker sofa set next to a lush garden of your favorite plants and flowers. A small bistro set can add a subtle charm, and is great for an intimate meal or a place to enjoy your cup of coffee in the morning. Available space should be taken up with greenery. If you don’t have any trees, plant a few around. They’ll grow up nice and strong with proper care and provide you with the natural shade. For the stone walls, add in plenty of flowers and shrubs. Go for perennials so that you won’t have to keep replanting flowers every spring. Try to go for plants that flower at different times of the year as well. That way, you’ll be able to enjoy flowering plants in your Tranquil Escape all year long. Perhaps you envision a space to gather around the fire while enjoying company, snacks, warm blankets, and a hot drink with your best friends and family. But how do you do this without recreating summer camp in the woods? By creating a warm, inviting, and extra comfortable vibe without compromising the feel of luxury and sophistication with a Cozy and Chic design. Accessories like throw blankets, pillows, and comfy chair cushions can really elevate the space from shabby to chic. Experiment with soft textures and materials that bring you comfort and give your space a luxe touch. Any color palette that emphasizes your personal style and feeling of “cozy” can work for this design. Consider light greys and browns are great for a softer color scheme, bright warm colors are great for a more lively feel, or bold earth tones that always complement an outdoor space. If you have or are considering getting a fire pit or an outdoor fireplace, set it as your focal point. Positioning your furniture around your source of heat will help create the cozy corner where you can have late night conversations with your guests as you all enjoy each other’s company, the stars, and the view beyond the fireplace. 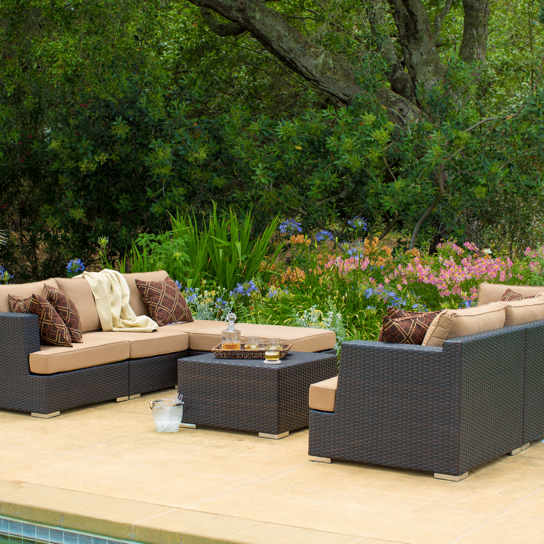 Sectional wicker sofas or outdoor patio deep seating sets with multiple pieces that can be rearranged to accommodate more visitors are essential. If you’re the type to always play hostess, you can design an Entertainment Epicenter without breaking the bank. Your main features for this type of design are going to be a fire pit, the grill or outdoor kitchen, and a giant flat screen HDTV. All of these appliances can be purchased at reasonable cost from many retailers. Make sure to protected your appliances with proper covers, or with an awning or roof to avoid damage from natural elements, including rain or sun. You can easily combine elements from the other outdoor luxury styles to your liking for this design. After all, a pool-side BBQ is just as fun as a nature-themed cookout in a Tranquil Escape. In some cases, Entertainment Epicenter spaces can tend to be filled with the latest technology and appliances, which often create a more modern, upscale outdoor restaurant or sports bar type of feel. If this is more of your taste, find furniture pieces that are sleek and clean, and accessorize with pops of metallics, blacks, whites, and greys. Another option is to lean more towards that of a rustic winery, with cobblestone, neutral and softer colors, and wood, wicker, or metal furniture with more unique touches. 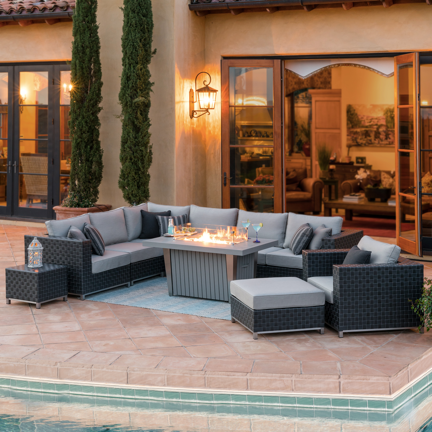 Outdoor furniture sets and sectionals laid out in front of different places (by the pool, near the grill, in front of the fire pit or TV) are going to be necessary to comfortably accommodate all your guests. Outdoor dining sets that can hold a large array of grilled delights and party snacks are absolute must haves. Going for quality, sturdy furniture will also ensure longevity of your luxury space. While wicker furniture is still a great option, you may also want to consider metal or solid woods. While you can rely on the fire for some light and warmth, make sure there is ample lighting when your get-togethers go into the night. A gorgeous chandelier can make for a show-stopping focal point, while wall sconces add a subtle touch of style to your space. Whether you want to get away from the busy city in your own private garden getaway or be the neighborhood host for the next big game, there are numerous luxury backyard designs that can work for you. Go for comfort and style without sacrificing quality. You may need to invest a bit in landscaping and hardscaping, but the right furniture and accessories will ultimately bring your luxury space together. Elegance and sophistication can easily be matched with practicality and cost-savings if you shop around for the right pieces. 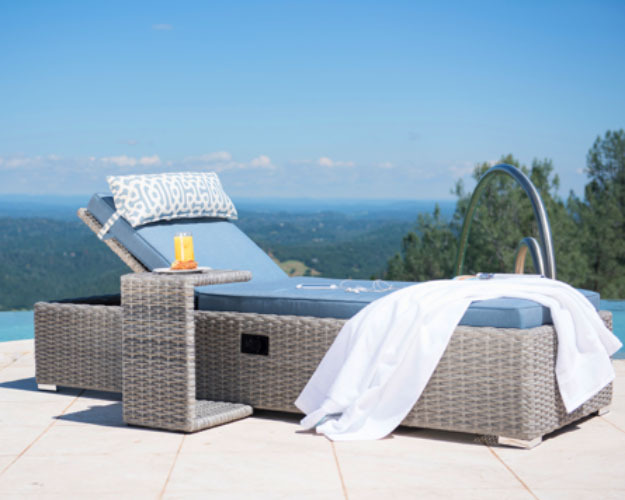 The perfect affordable luxury patio furniture will easily turn your backyard into just the right place to relax and entertain year-round.